I’m one of the lucky ones who gets to sail off over the horizon every once in a while, and one of my my latest trips had me leaving Hampton, VA, aboard Anne and Miles Poor’s Tayana 55 Karina about an hour after I arrived at the marina from the airport. I shot this picture with my iPhone after leaving the Chesapeake and settling into the rhythm of the trip. Since we were still in cell-phone range, I started texting and facebooking all the people I love and including the photo above. Kinda cool knowing that you’re going to be way off the grid for about 7 days, but also to have several hours to do nothing but motorsail (the winds were light), and reach out to the people in your life that you want to have enough time for. The texts, and facebook messages, and tweets that accompanied the photo and my “We’re headed to the Caribbean through the Bermuda Triangle!” tagline were just wonderful. I could go on and on about what it means to sail away from land for a while but that’s juicy fodder for another blog post. For now I’m just gonna stick to what it’s like, and I’m finding that video is, um…news flash…a pretty cool way to show you exactly what it’s like, sort of. So please stop reading this post, watch the video above, and then please return to reading the written words and gazing at the still photos that you’ll find in the rest of this post…. 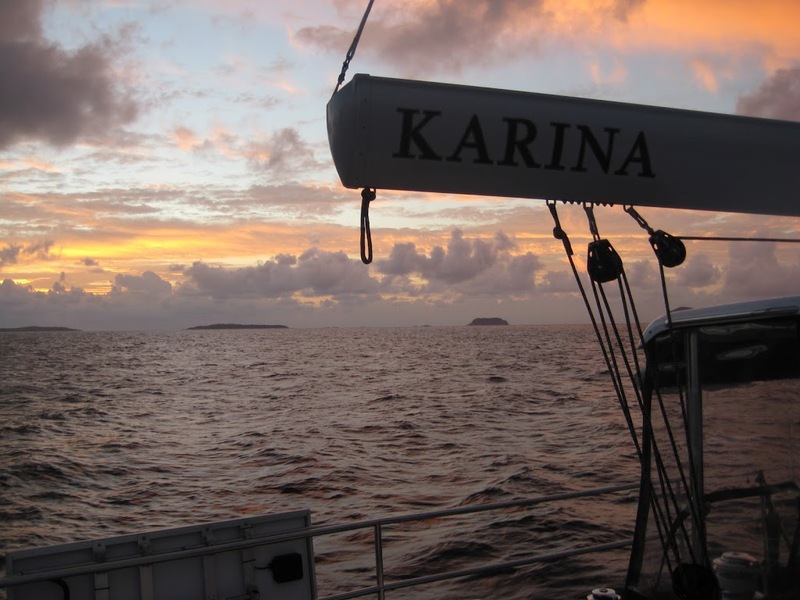 So, now you know what sailing at 10 knots, under sunny skies, with dolphins frolicking at the bow, and steaks and fresh-caught fish cooking on the bar-b-q, and what a glorious sunrise as you make landfall at a Caribbean port after 7 days at sea looks like. But there really is more to the story. Like in the photo above. That’s really what sailing offshore looks like, at least sometimes. There’s nothing but the flat line of the horizon for as far as the eye can see. For miles, and miles, and miles. How would you feel if everything you know and love was left somewhere in your wake and all you have is…the flat line of the horizon for as far as you can see? It’s actually a pretty neat thing to experience. I shot this photo when we were about 600 miles from the nearest coast. 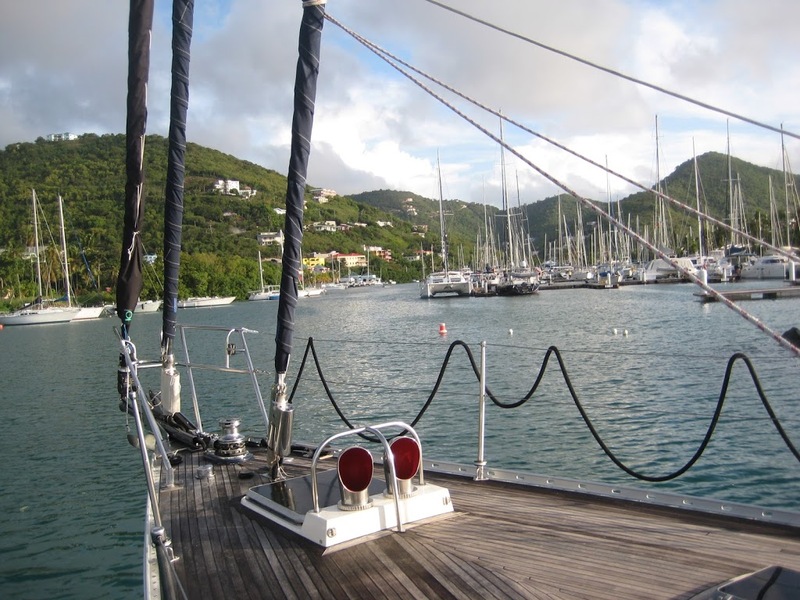 We’d crossed, and been tossed around by, the Gulf Stream, and were in the full offshore groove—sail, sleep, shower, eat, repeat. 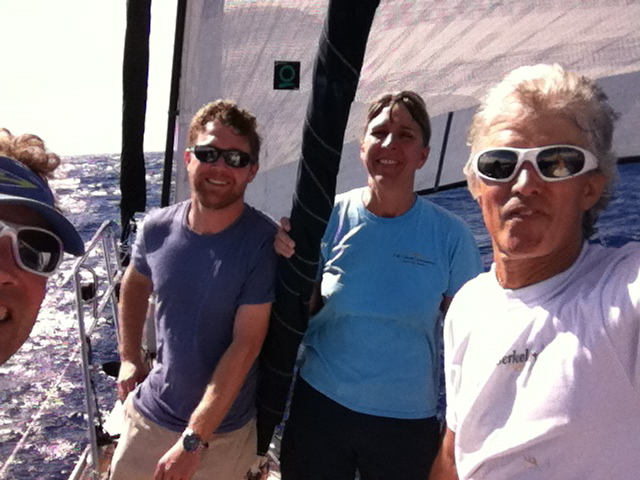 I even had time to sit in the shade of the jib on the foredeck and meditate. You know those white-noise machines that have “ocean” or “waves” settings? 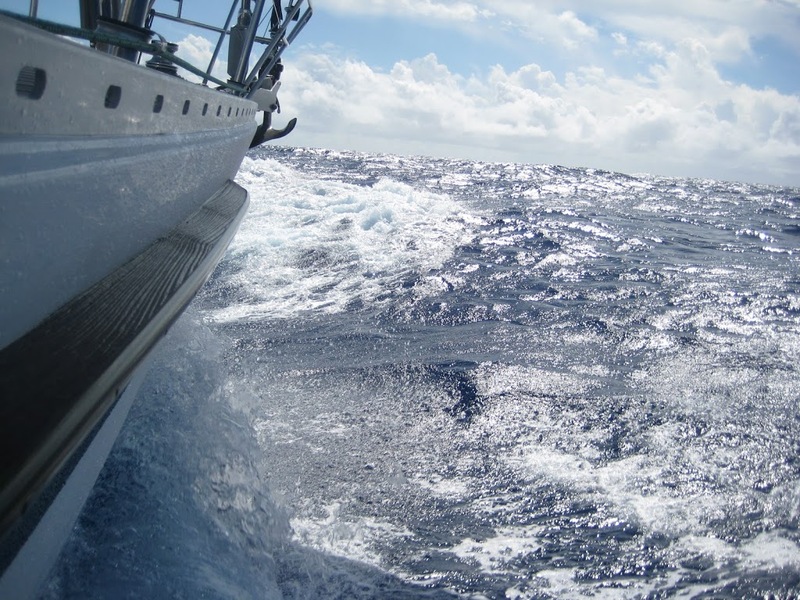 Picture experiencing the real thing on a 55-foot-long, 80,000-pound boat surging down the actual waves that are making “white noise” toward a tropical destination. Now picture having the time to just sit and actually experience (physically and mentally) what that sounds, smells, and feels like. Did you know salt air has a texture to it? Here we are. The crew of the mighty Karina. I’ve done tons of offshore trips with people I didn’t know before I showed up on the dock with my sea boots. As a result I’ve met all kinds of people in what is actually a pretty intimate way. Sailing and living in cramped quarters, being sweaty, hot, cold, sick, uncomfortable, and even happy on a boat offshore is a wonderfully unique experience. I’ve seen tough guy CEO/owners go all mushy in the face of offshore adversity, and I’ve seen more than a few big-talking sailors actually get a little weak in the knees when things get rough, and I’ve seen tons of “little guys” just get it done too. But I felt like the Sea Gods were smiling down on me during this trip. Boy did our crew hit it off! Matt (in the blue shirt) is ex-coast Guard and one of the nicest and most competent sailors I’ve ever met. Anne is a good, funny, and unflappable mom who’s a crack navigator and crisp conversationalist. And then there’s my man Miles over there with his white sunglasses. When I arrived in Hampton I knew I’d picked the right boat and the right captain when Miles bounded up the companionway wearing a dope pair of white Oakleys that seemed rather familiar to yours truly. Don’t we look like a happy bunch? We were. That photo was taken during our little dolphin interlude and the joy was palpable. When was the last time you felt joy? Hopefully it wasn’t too long ago. And if it was, I hope this is a little reminder that it’s possible, and you don’t have to be on the bow of a boat to find it either. This was the tropical seascape that greeted us after 7 days of infinite horizon in all directions. We couldn’t have timed it any better. The air was…soft. The sky was…soft. The seas in the Drake Channel were…pancake flat. And we all had visions of the pancake breakfast we were going to eat on land as soon as we arrived. There really is no better way to enter a foreign country than by sailing there under your own power. Almost there. Nanny Cay, Tortola, BVI at about 0700. And while sometimes it’s nice to have time to settle into a new place, I was already working the Internet to see if I could change my ticket so I could get home a day early to my beautiful wife and my wicked cute baby boy. That’s another benefit of offshore cruising. Having the unfettered time offshore to reflect on all the good things you’ve left behind makes it that much more special when you first make landfall and then punch your ticket home. So, after working the airlines to make the early return that happened on a holiday weekend, I found myself in the exit row on a Jet Blue flight from San Juan to Boston. Now who walks down the aisle and proceeds to sit right next to me in their assigned seats but my step-cousin (his aunt married my dad) and his wife. I know? Small world, right? Totally cool coincidence. They were coming back from sailing in the BVI too, but that’s more rich fodder for a future post. 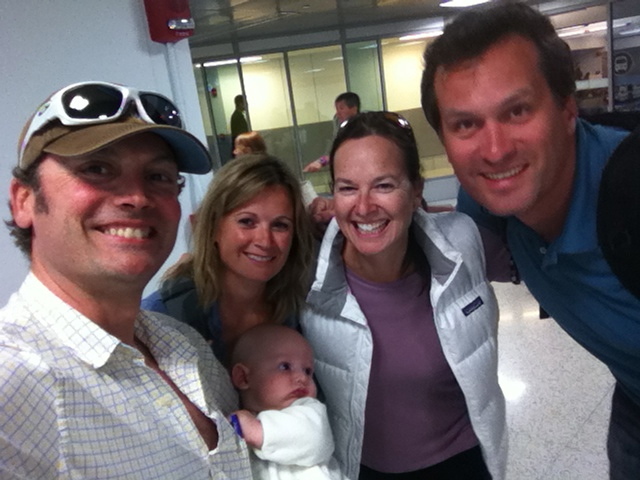 And then……… who decides to surprise me at the airport (as opposed to just picking me up in the car as usual) but the Honey Bunny (in the white vest) and my Lil’ bald man (in his white onezie). I sure do love riding the automatic sidewalk with Mr. Splishy. It’s an adventure of gummy smiles.